“Lighting is a fascinating medium which brings this magic touch to any live show.” Alexandre Lebrun, Founder of LightLab, shared with Luxe.CO. In a fashion show, lighting design is essential. It creates an atmosphere and a dynamic, but also moods and emotions through lighting effects and color temperature. It highlights both the collection & models, contribute to a perfect photo and video, dress and reveal spaces and finally tell stories while respecting the brand identity. Studio LightLab is a lighting design agency based in Paris & London, behind luxury brands shows like Louis Vuitton and Gucci. It was founded in 2008 by Alexandre Lebrun, a lighting designer and artistic/photography director with over 20 years’ experiences within the live event industry. Alexandre pushes the boundaries of creativity and imagination, explores arrangements, ambiances and moods, establishes synergies between artists, fashion and set designers, musicians, adding a real “experience” to any event. In an exclusive interview with Luxe.CO，Alexandre shared with us his experience and insights in lighting design. Luxe.CO: How do you define Light Lab? LightLab has cooperated with many luxury and fashion brands, for example: Givenchy, Armani, Bottega Venetta, Louis Vuitton, Nike, etc. What are the advantages of Light Lab compared to other competitors? Why so many brands have chosen Light Lab? Alexandre : LightLab is a lighting design agency based in Paris & London, dedicated to the live event industry, from fashion and luxury to corporate events, live music shows, performing or public arts . Adding a real visual experience to any event, we bring client’s visions to reality, whilst ensuring quality implementation and execution with our team of specialists. Our productivity is a real force, which enables us to always meet the most complex aesthetic and artistic requirements from the first stage to the lighting set up on site. This is probably what makes our identity and our difference, our keen interest in art and culture through artistic references and inspirations sourced from visual arts, sculpture, design, photography or architecture. Luxe.CO: What kind of unique lighting solutions can you provide to brands? Alexandre : Composed of a specially selected team with different background from product design to live music and architecture, we love to innovate, meet challenges, explore, look for new approaches, face obstacles and overcome them. Driven by passion and a continual work in progress attitude, we always try to reinvent ourselves to be able to propose custom and original concepts for each events and brands. Both constant artistic research and knowledge of the lighting products market are part of our design process and this allows us to find the most suitable lighting solutions. The client budget, site scales, site constraints, and the brief from the client and producer will determine the type of fixtures and rigging solution we would use. Luxe.CO: Among all the cases, which is the most challenging one? Please give us a brief introduction of this case. 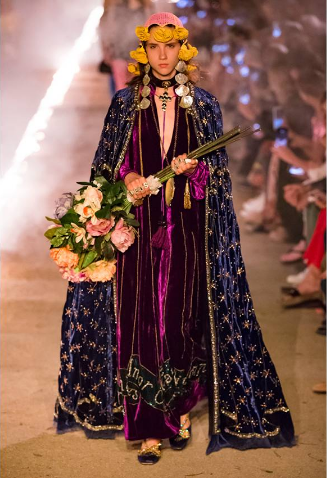 Alexandre : For the recent Gucci – Resort 2019 show in Arles, taking place outdoors, in the heart of a 2000 year-old cemetery, the designer wanted an illusion of a candle and flame lighting matching the dramatic, natural and historical set, while highlighting the beauty of this spiritual site. An interesting challenge for us! Luxe.CO: From design to execution, what’s the process of cooperating with a brand? And which is the most challenging part? Alexandre : The fashion show & event production agency is the link between the brand and us. At the first stage, we are contacted by the production agency who share with us the show design brief. The production creative director and the client may have some lighting requirements as well (could be a theme, general color temperature, a mood, some references) that we take into consideration in our lighting proposal with different options of lighting concept. For each project, we expertise comprise creative & technical production (lighting proposal, mood board, pitching, 3D visualization, CAD lighting plans, liaison with the technical supplier and set designer),We then follow up every updates from the client and adapt to each changes from the first site visit to the final stage. On site, I drive the lighting focus and lighting programming making sure the producer and brand’s brief is respected but also bringing my own ”touch” and look. The other concern is to achieve an homogeneous lighting, without light intensity gaps to make sure the photographers and video team get the light they need. That is the most challenging part, finding the perfect balance between the live show lighting and a perfect photography lighting. Luxe.CO: How to turn your clients’ concept or idea into reality? Alexandre : Once we get the client brief, we share our artistic inspirations, the fixtures list specifying the light effect through a lighting proposal and technical plans. We work then closely with the technical supplier who will be able to make the most tricky lighting concepts possible, so this is crucial to have excellent relationship with them! The technical supplier put into reality our concept and anticipate any footprint, weight, cable way or rigging problems. In terms of fixtures we can adapt to their equipment and avail abilities as much as we can to fit into the producer budget. We also check together the possible venue constraints, in short this is a proper team work! On site, the lighting technician team set up our lighting plan and I drive the lighting focus and programming bringing my own touch. Luxe.CO: What role do you think lighting design plays in a fashion show? Alexandre : In a fashion show, lighting design is essential. It creates an atmosphere and a dynamic, but also moods and emotions through lighting effects and colour temperature. It highlights both the collection & models, contribute to a perfect photo and video, dress and reveal spaces and finally tell stories while respecting the brand identity. Lighting is a fascinating medium which brings this magic touch to any live show. Luxe.CO: In addition to fashion shows, what other scenes do you think the creativity and innovative technical solutions can apply to? Alexandre : Lighting design and innovative technical solutions play a key part in any brand events such as collection/product launches, live music shows, theater, dance shows, public art through light festivals and temporary light sculptures and architecture. Alexandre : We observe trends during each fashion weeks and seasons. In terms of lighting, the recent ones were reflexion through mirrors, lasers, natural flood light & daylight, interplay of shadows and light. As the beauty of fashion is to push the boundaries, we always feel the need to be creative ourselves exploring possibilities provided by new lighting products and technologies.We keep questioning ourselves, being challenging and surprising, in order to make difference as well as the fashion designers do. Alexandre: We are living an exciting period where the bridges between disciplines (fashion, art, music, dance, design, architecture), new technologies (video, Virtual Reality, drones, robots, motion sensors) and new consumption and communication means come together easily. This is positive for the fashion industry, the increase of brand events and their influence to a larger audience through social medias & platforms reflect this dynamic. Creativity benefit from these movements as each shows or events become more and more spectacular and proper immersive experiences. Luxe.CO: How much do you know about Chinese market? What do you know about Chinese fashion brands? Have you ever seen any Chinese brand’s fashion show or event? Alexandre: We recently met different actors of the event and luxury industry in Shanghai and at the CIFTIS fair in Beijing supported by Business France. This allowed us to have a great understanding of how to approach the Chinese market, and to take part in future opportunities. We have the opportunity to work for prestigious French and international brands. This has led us to contribute to projects either in China through the Asian branch of renown French event producers, or local designers, or with Asian designers who held their shows in Paris during the recent Fashion Weeks. China has gradually become the first global market for luxury brands, not only by its size, but also thanks to societal changes, luxury shoppers are increasingly impulsive and heavy spenders while many Chinese fashion brands are emerging and becoming as successful as European ones. In parallel, the Chinese regime and local institutions invest massively in large scale cultural facilities. These factors constitute a dynamic hub, opening up to the world of art, expanding trends with enthusiasm and showing qualitative evolution.This artistic effervescence and cultural vitality motivate our project to expand in China and therefore support public and private actors with our expertise. Considering that lighting design is very specific and regarded as a niche, we have a part to play in the fast growing event & fashion Chinese industries as well as the developing public art field. Luxe.CO: What kind of partners you are looking for in China? Alexandre: At the moment we are identifying both french and local fashion & luxury production agencies in China for futures collaborations with the aim to take part in Chinese fashion designers shows and brand events. On a technical aspect we are looking for local reliable technical suppliers, as well as local skilled and competent lighting programmers, and assistants, to grow our team in China. LightLab is a lighting design agency based in Paris & London.The agency is dedicated to the live event industry, from corporate events to fashion and luxury, live music shows, performing or public arts . They cooperate with Paris, London, New York Fashion Weeks and also have YSL, Isabel Marant, Louis Vuitton, Dior, Chanel, Givenchy, Courrèges, Sonia Rykiel, Victoria’s Secret, Sandro, Cartier, Agnès B, Acne Studio, Adidas, Puma, these luxury and fashion brands on the clients list.